Everyone had fairy tales read to them when they were kids, right? Think back on a few of them--Snow White and Hansel and Gretel are two that come right to mind. There are stepfamilies involved in both of those, and boy, the wicked stepmothers are the worst! Well, in my case, it's not just stepmother problems. My entire family--biological and step--is coming to Key West this week for my friend Connie's wedding. These are people who couldn't get along when they lived together, and they certainly don't get along now. And they'll be stuck on the same 2 by 4 mile island, all wanting time from me! 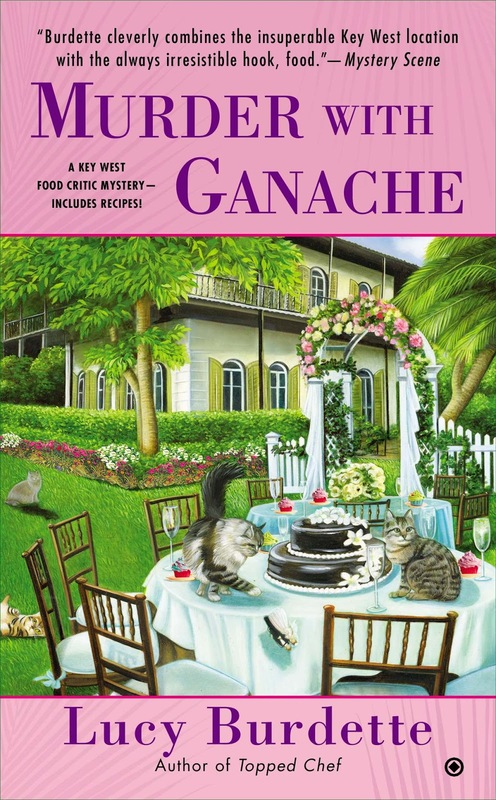 I'll tell you the whole story--the book is out this week--MURDER WITH GANACHE. But here's a little taste of what I'm in for. Casa Marina Resort sits on the east side of the island, its sumptuous grounds and elegant Spanish mission-style buildings sprawled along the Atlantic Ocean like a voluptuous sunbathing woman. I parked my scooter in the lot reserved for two-wheeled vehicles, removed my helmet and fluffed my hair. Was it Freud who said “Happy families are all alike; every unhappy family is unhappy in its own way”? Or, maybe Anna Karenina, who definitely had her finger on the pulse of unhappiness. I loved each member of my family individually--the way I loved both vanilla and chocolate. But taken together, in the same hotel, sharing my attention over the weekend, they promised to morph into a marbled batter of familial drama. Ugh. Marble was my least favorite flavor in all the world of cakes. Pushing away a cloud of dread, I took a deep breath and plunged into the lobby, immediately drawn to a grand vista of the ocean on the outside. Reflecting pools, outdoor dining tables, palm trees and a bar by the water promised heaven to the customers waiting to check in. I took a calming breath and forced my attention back inside. Even if I hadn’t instantly recognized my mom’s auburn hair and my stepmother Allison’s yellow-blonde, the tension between them would have given them away. Mom and her boyfriend Sam sat holding hands on one oatmeal-colored couch in the far corner of the enormous lobby, my father and Allison on the settee catty-corner to them. No friendly body language connected them at all. My stepbrother--or a gawky half-grown-up, shaggy-haired version of the boy I hadn’t seen in months and months--paced out on the patio that overlooked the water, earbuds in his ears, thumbs working furiously on his cell phone’s keyboard. She hugged me hard and then tugged her boyfriend forward. If boyfriend could decently describe any man past fifty. “I know you two have met on Skype, but here we all are in the flesh.” She clapped her hands together and waited for us to embrace. We exchanged stiff hugs and back-pats and then I excused myself and hurried over to greet Dad and Allison. “Exquisite,” called my mother, though I hadn’t addressed the question to her. “Overpriced and overdone,” muttered dad. It's me Hayley again. You can see I'll need lots of moral support! Follow Hayley's adventures on Pinterest, Facebook, Twitter, or on Lucy's website. Oh, dear! You have my support! Love this! Can't wait to read it. It's always so reassuring to know that it's not just my family that has issues!